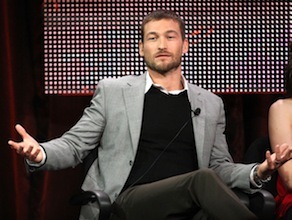 Andy Whitfield, who played the title character in the Starz network's graphic Spartacus: Blood and Sand, died Sunday of cancer in Australia. The Wales-born actor was just 39 years old. He had been diagnosed in March of last year, with Starz crafting a six-episode prequel, Gods of the Arena, in hopes of marking time until Whitfield recovered. The role later was recast, with Liam McIntyre set to star as the fabled gladiator when Spartacus: Vengeance premieres in January. In a statement released Monday morning, Starz president and CEO Chris Albrecht praised Whitfield as a "champion on-screen" who also was a "champion in his own life. Andy was an inspiration to all of us as he faced this very personal battle with courage, strength and grace." During a late July interview session as part of the Television Critics Association summer "press tour," Spartacus executive producer Stephen S. DeKnight said he had seen a photo of Whitfield "a couple of months ago and he looked better than I ever have in my life. We are hoping he makes a full recovery. He's permanently stepped away from this role, but Andy and I always joke about one day working together again. And I would like nothing more than to work on another series with Andy." McIntyre said that Whitfield was "exceptional" in a role "you wish was never there . . . But I've got an obligation to the fans, to the show and to Andy's Season 1 legacy to deliver on that." Whitfield had contacted him to say, 'Good luck, well done,' and give me some tips and advice on how to get through the grueling schedule," McIntyre said. "I think that speaks volumes of the man." ***Sunday night's Creative Arts Emmys, prelude to the Sept. 18th major awards ceremony on Fox, also had their share of notable trophy bearers. HBO's Boardwalk Empire topped all programs with seven wins, all of them for behind-the-scenes activities.